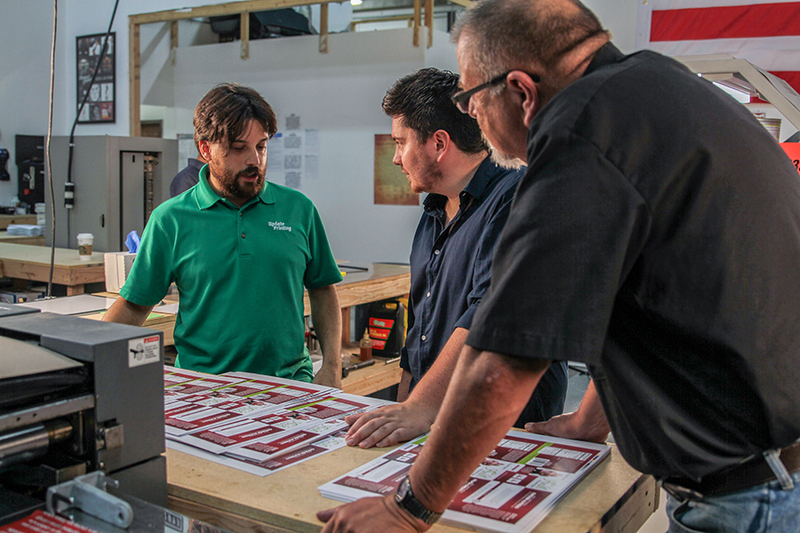 We’ve provided cutting-edge printing technology with a customer-first mentality for 36 years. When we say we do it all, we mean it; our shop has the equipment necessary to get your print job done right. We deliver the highest quality products on tight deadlines because your success matters to us. We get the job done right so that you can use and distribute your printed materials with confidence. We are a full-service, custom printing company located in Colorado Springs, Colorado. Family owned and operated, we’ve served the Front Range for more than 36 years with top-of-the-line printing services using the latest printing technology. We know the ins and outs of printing, which is why we’ve stayed in business from the time of manual typesetting and ink-mixing to today’s digital, color printers and wide-format printing. Through 36 years of business, we’ve held fast to our core principles. We’re committed to providing excellence in service, quality, and value. We care about our customers and their success, which is why we work hard to get them the best product possible in the timeframe that they need it. And, if something isn’t right, even if the mistake originates with our customer, we put in the extra time, effort, and money to make it right. In today’s noisy world, printed media must be bold, creative, and finely created to stand out and leave a lasting impact with consumers. Ensure that your advertising projects, from bumper stickers to door hangers to postcards, can grab and hold eyes with the help of Update Printing. We offer a wide array of advertising services that help companies and individuals get the word out. Don’t settle for B-level business cards that end up lost in a stack or tossed in the trash. Work with our team of printers and creatives to develop business cards that stand out in the bunch. Want octagon-shaped business cards? We’ve done it before! If you can dream it, we’ve got the printing know-how to help you separate from the crowd. Along with printing cards, banners, pamphlets, and other materials, we also provide services that go beyond simply print and delivery. We provide direct mail, collation and bindery, rush orders, and digital and traditional press services. We perform custom print jobs in both large and small runs. Have an idea on a tight deadline? Let’s talk! RE/MAX Properties, Inc. has been using Update Printing for most of its corporate printing projects. Update Printing has great turn around times, great pricing and the quality of the finished products has always exceeded expectations. The Management and Staff at Update Printing are always friendly and helpful and often will suggest cost effective solutions for our projects. MARKETING COORDINATOR, RE/MAX PROPERTIES, INC. The folks at Update Printing provide top-notch, personalized services and great products. We trust them to deliver high-quality products that we can confidently pass along to our clients. Plus, they’re a lot of fun to work with! The Update Printing team continually delivers great banners, handouts, and other print jobs for our business. Update Printing is reliable, fast, cost-effective, and very detail-oriented. I highly recommend using them for any print project.